What is the DrawTech Graphics Enabler Utility? The DrawTech Graphics Enabler utility is a tool that allows users who do not have DrawTech installed on their machine, but do have AutoCAD MEP installed, to view our DrawTech labels and objects correctly. We include this utility as a part of every DrawTech installation. Users who only have the Graphics Enabler utility installed on their machine will only be able to see DrawTech objects and labels. They will not be able to modify these objects in any way. To use the utility, start by downloading it. You can download the utility by clicking here or by clicking the link at the top of this page. Once downloaded, simply run the exe and run the installer to install the Graphics Enabler Utility. Once the installer has finished, you’ll be prompted with the following window. This window will only show the version of AutoCAD MEP that you have installed on your machine. Select the versions of AutoCAD MEP you wish to view DrawTech drawings in and then hit “OK” to make your selections and close the window. Note: You can bring this dialog box up at any time by navigating to C:\Graphics Enabler Utility and running the GEI.exe file. At this point, once you load one of the versions of AutoCAD MEP you selected in the previous window. 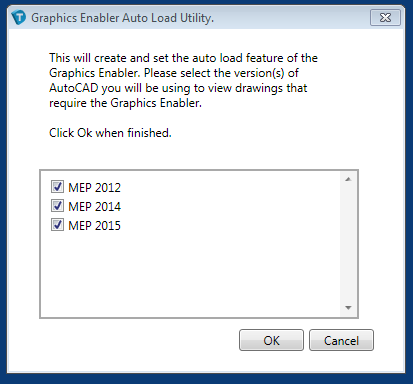 It will automatically load the DrawTech Graphics Enabler. You may receive the following dialog window once you start AutoCAD MEP. If you do, hit “Load” to continue. 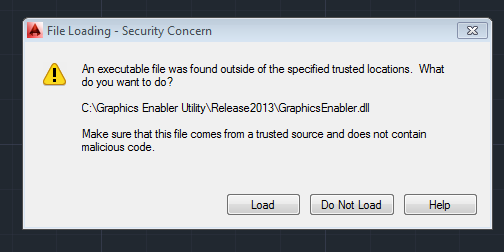 This will tell AutoCAD that the Graphics Enabler can be loaded and begin functioning. At this point you can view our drawings with our labels in tact! Should you have any questions or issues, please email us at support@drawtech.com.